Health by Motorbike | Hupy and Abraham, S.C.
After visiting Kenya and learning of health concerns local women there had, Araceli Alonso embarked on a journey of education, fund raising and humanitarianism. Alonso, a former nurse, teaches at the University of Wisconsin-Madison, in the Department of Gender and Women's Studies and for the School of Medicine and Public Health. While traveling in Kenya in 2009, she met women in remote villages who were concerned about the lack of health care, especially the problem of malaria in older women. Something as simple and inexpensive as mosquito netting could help reduce the disease which is a leading cause of mortality in the area. Back in Madison, Alonso started applying for grants to help aid her in an initiative to bring much needed medical supplies back to Kenya. Because some of the villages are so remote, the best way to get to them is by motorbike. This spawned another idea in Alonso's head and she established Health by Motorbike. The Health by Motorbike project brings doctors to rural towns in Kenya near the border of Tanzania, promoting health literacy and sustainable community development. This is a success story about women empowerment and leadership, utilizing local women in the villages to lead the way in educating others on health matters. Recently, Attorney Michael Hupy and his wife Suzanne visited Kenya and found the people there very friendly and gregarious. The work being done by Alonso and her student volunteers from UW-Madison reminds us of the initiatives the late Simon Milward embarked on in the 1990's, seeking funding for motorcycles to access remote regions in Africa, Asia and South America with medical supplies. His epic Milenium Ride, in which he rode across every continent on earth to raise awareness for Doctors Without Borders, centered on the same concept as Alonso; remote villages in need of medical supplies could only be reached by motorbike. 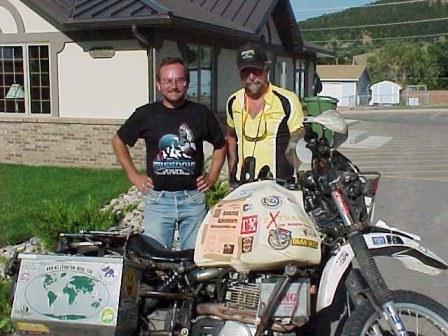 Simon Milward and Tony Sanfelipo in Sturgis, one of Milward's stops during his Milenium Ride. Milward died later, while traveling through Africa after losing control of his motorcycle on a remote road.